Pithiviers recipe by Uzma Azizna at PakiRecipes.com. In a food processor, grind together the sugar, butter, egg, almonds , extracts and rum until light and fluffy. Line a shallow 6 inch bowl with plastic wrap and spoon in the nut mixture. Smooth the top flat and chill in the freezer 30 minutes to form a disk of firm nut filling. Meanwhile, roll the puff pastry out a bit thinner just to flatten it and make the sheets square, about 10 inches, then chill them. Using a pizza cutter and a lid or cake pan as your guide, cut the largest disk possible out of both pieces of pastry. In a small bowl, whisk together the egg and water to make an egg wash. Place one of the pastry disks on a parchment lined sheet pan and paint a 2inch border on the edge of the pastry with the eggwash. 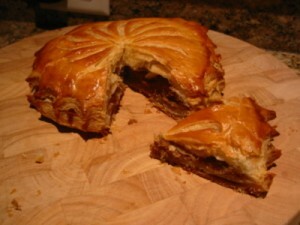 Pop the chilled nut filling out of the bowl, peel off the plastic, and place it in the center of the pastry. Carefully place the second pastry disk on top and ease it over the nut filling smoothing it out on the edges to match up the bottom piece. Brush the whole top surface with egg wash. Using a small sharp knife, score the surface of the pastry decoratively in a spiral pattern. Bake for 15 minutes, then turn the oven down to 400 degrees F for 30 to 40 minutes more. Ten minutes before the cake is done, sprinkle it with powdered sugar then finish baking. Cut into wedges to serve. I am going to make this recipe for my boyfriend Hasan who is Muslim and does not drink alcohol. Born & raised catholic myself I am now studying Islam and as a personal choice have given up alcohol , not that I drank much anyway, and do not eat pork products. ANYWAY, there are a bunch of recipes I have made for Hasan which had alcohol as an ingredient and I just looked online and found substitutes. Maybe you can add a link so such sights for those who honor God by refusing alcohol. For light rum, use pineapple juice flavored with almond extract. For dark rum, use molasses thinned with pineapple juice and flavored with almond extract. Or use rum extract flavoring. This look delish and I cannot wait to try it. Thank you for such a wonderful site!